You can easily convert any WAV file to MP3 format by using one of two free methods we’ll detail below, both are simple and fast. 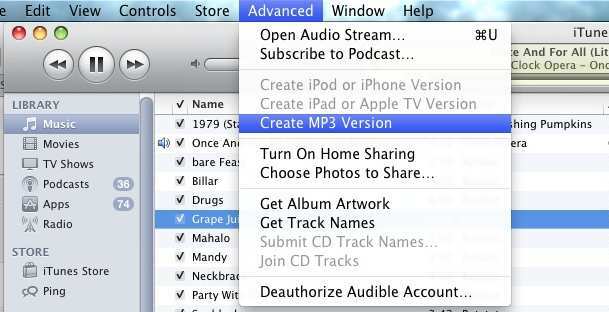 The first trick uses iTunes, and the second tip uses a utility called All2MP3 to handle the audio file conversion. iTunes is ubiquitous and cross-platform with Windows and Mac OS X support, and will handle the conversions easily, or you can go with the free download called All2MP3 that will convert the audio too. We’ll cover the two methods of wav audio file conversion and you can choose whichever is most relevant to your situation. Apple’s popular and free iTunes media player can also do some basic file conversions, although it’s not just a matter of drag and drop. This method will work the same in iTunes on Mac OS X or Windows, and this cross platform versatility is why we’ll cover it first. You can then delete the original wav files from iTunes if you want. Using this method you can also convert a .wav file to M4A, AAC, and AIFF, as we showed in convert songs to other formats using iTunes. The process is identical. All2Mp3 is a great conversion utility for several reasons: one, it’s free, and two, you can adjust the bitrate quality using a sliding scale (default is 320kbps). It’s also very fast and extremely easy to use thanks to it’s simple drag and drop interface. All2Mp3 works quickly and will default to outputting the new mp3 file in the same location as the origin .wav, so look for the file there unless you specify the path as otherwise. Notice that All2mp3 handles many more conversions than just .wav files, you can drop nearly any audio file type into the app and it will convert it to the easy to use and widely accepted mp3 format. You may recognize it as the same app we used in our how to convert FLAC to MP3 guide, as well as converting WMA to MP3 and others. All2Mp3 is Mac only so if you’re trying to convert some .wav files before transferring an iTunes library from a Windows PC to Mac, you’ll want to use the iTunes method instead. Thanks for the tip, but have a question – how exactly do you put .wma files into iTunes? Drag&drop doesn’t work at all, neither does import/add to library (O) option in File menu. Been using a Mac (MBP) for 4+ years and importing .wma files never worked to my knowledge in any iTunes version since then. I would recommend converting the WMA files to MP3 for use in iTunes. You can do this with the free All2MP3 tool mentioned above, it’s drag & drop and very easy to do. Thanks. I followed your instruction to convert wav files to mp3 using i-tunes. It was very simple. It is simple to add files to i-tunes. open FILE drop down menu select ADD FILE TO LIBRAY and select file. The file will be added to library. Next, to convert the file go to PLAY LISTS and select ‘RECENTLY ADDED’ and convert the file as instructed. Hope Mr. Richards finds this useful. .wav files have always been supported by iTunes. Thanks…so nice to have this info available…very helpful! Thx man. Very helpful. You saved me time. Hi, Thanks for your help. It saved my work. You can use Avdshare Audio Converter to Convert WAV to MP3 or Convert MP3 to WAV. Thankyou this was very helpful, the only thing i have to add is that in the new OSX once you have selected the .wav file to do the conversion the ‘create MP3 version’ option is located in the File tab in the menu under the ‘Convert’ option. All2Mp3 has a virus according to the latest VirusBarrier – avoid it! When I tried to instal VirusBarriers warned me it carried a virus. So I did not install it.